Since writing about Bang, Ai Weiwei’s enormous installation at the 2013 Venice Biennale constructed entirely out of traditional three-legged stools, I discovered that he had produced several smaller sculptures using the same piece of furniture as the basic repeating unit. I’m not sure why Ai Weiwei is so fascinated by these stools but one can’t help admiring the skill of the designers and woodworkers who brought these sculptures into existence. I’ve no ambition to make these stools into sculpture, but after completing a single scaled down stool (see earlier post)I thought I’d make a larger version to use in the workshop. Here it is. The seat height is 22 inches and the legs are splayed at 8º from the vertical, which makes the proportions taller and narrower than the original. The legs and stretchers are Douglas fir and the top is English Cherry. It’s finished with a couple of coats of Danish oil. A couple of years ago, Wouter Hilhorst, an architect and luthier from Rotterdam, showed me some violin-making planes that he had carved from oak and boxwood. There are a few photographs of them here. Some of these planes were in the Japanese tradition, others miniature versions of western planes, but all had been made from a single block of wood. 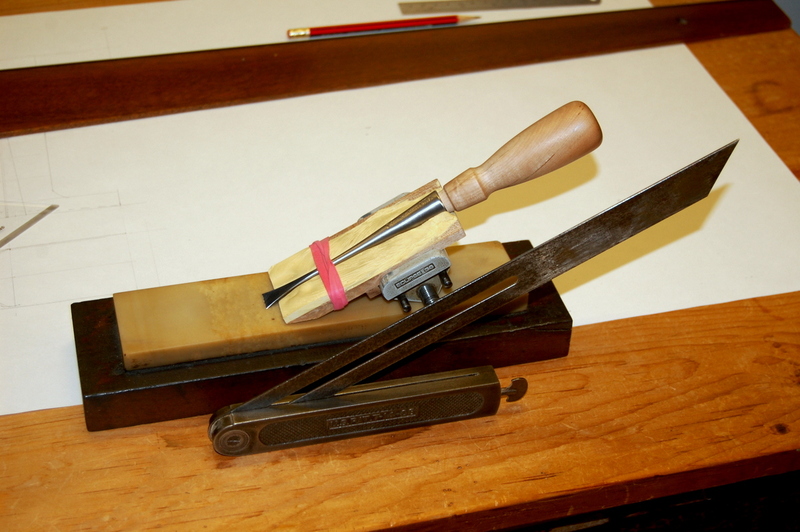 I had made several small planes for instrument-making too, but I’d always used the Krenov sandwich technique, which I’ve written about at length before. (See here and here. 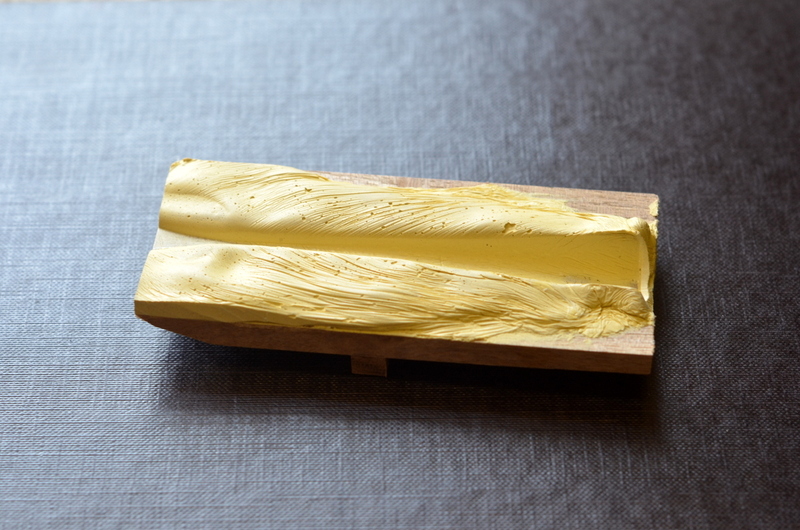 A few days ago, I tried Wouter’s method using a small block of lignum vitae, which I reckoned would have the right properties of hardness and self-lubrication. This is what I managed to come up with. 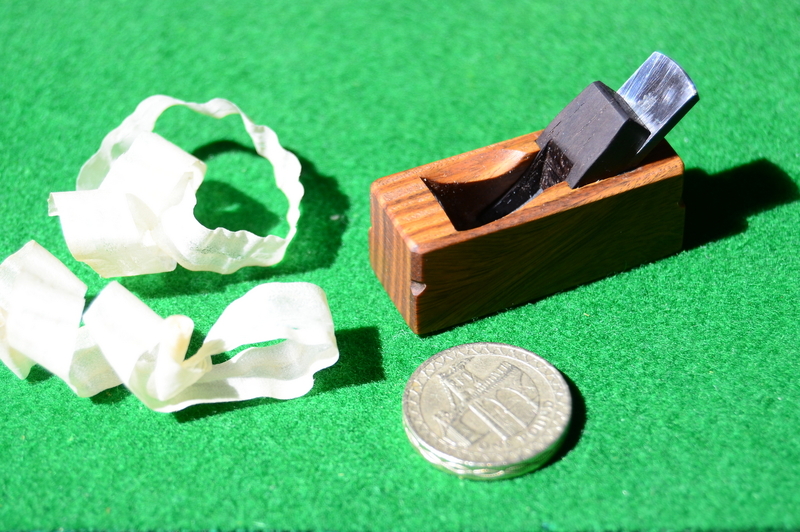 The coin, £1 sterling, 22.5mm (≈7/8 inches) in diameter, is there to give an idea of scale; the long shavings prove that plane actually works. The blade is a Japanese blade from Dictum, a generous gift from Wouter, and the wedge was fashioned out of a scrap of Rio rosewood. 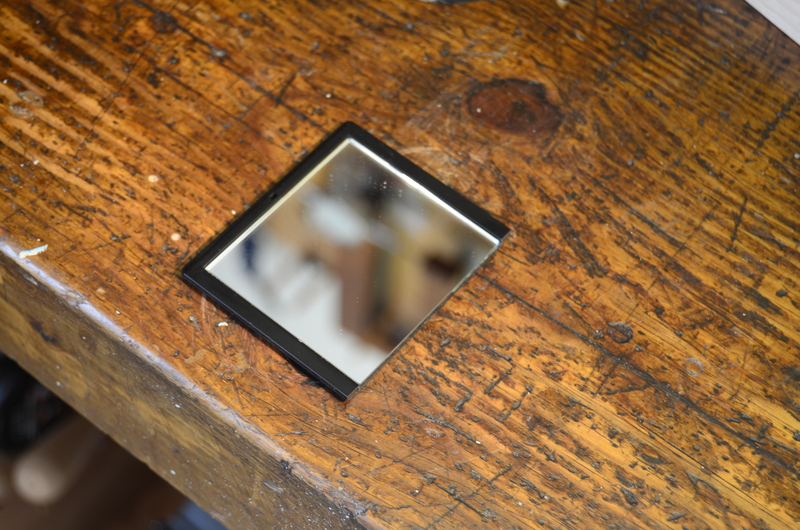 This photograph of it with a No 4 smoother gives a sense of its diminutive size. My son, who is an engineer working on the design of big diesel engines, tells me that it’s all too easy, especially with CAD software, to draw what seems a brilliant plan – only to meet derision when someone realises that it can’t be manufactured. You can imagine the sort of thing he means: a nut where there isn’t enough space to get a spanner in to tighten it; or the need for a long bolt in a place with insufficient clearance to get it into the hole. As someone who works with wood, I enjoy teasing him with the complete opposite: something that self-evidently has been manufactured but that looks impossible. One example is the captive screw here. 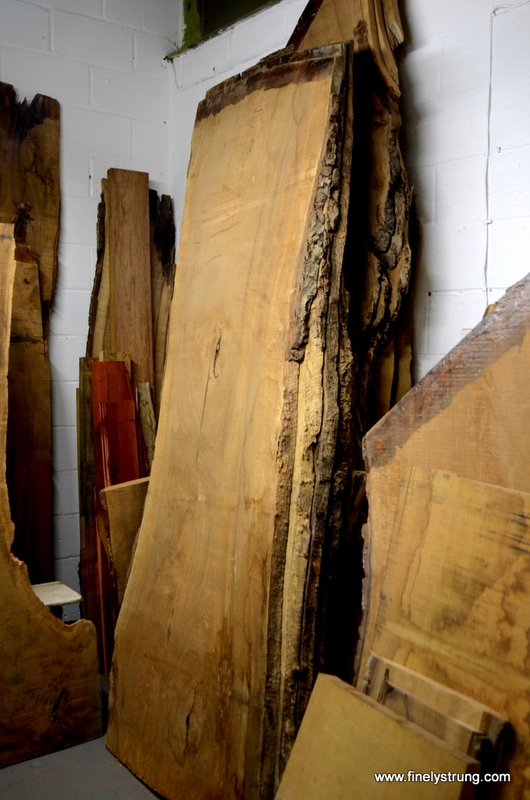 But that’s a bit of a cheat because it depends on exploiting the remarkable elastic properties of some woods when treated with heat and moisture. Better are the apparently impossible double and triple dovetails that I wrote about a year or so ago. Here’s something in the same vein that can be sculpted out of wood with nothing more than a sharp chisel. 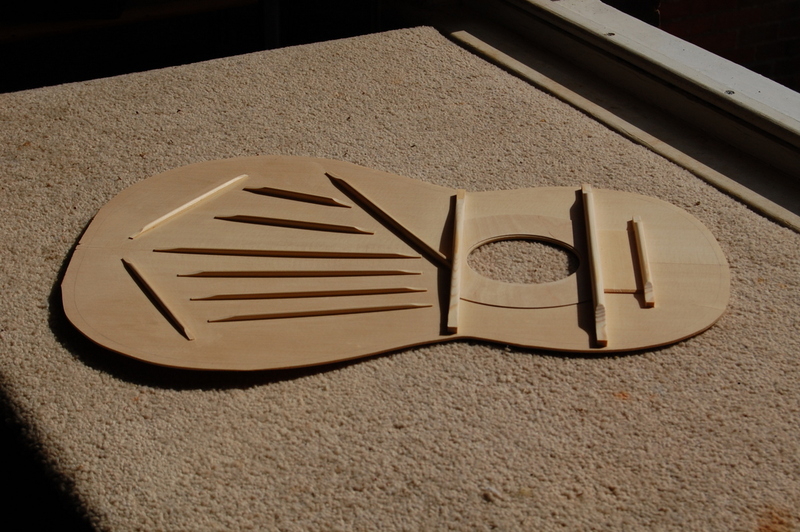 Or, should you have one handy, a 5-axis CNC milling machine will do the job almost as well – see here. For larger images, click on the thumbnails. 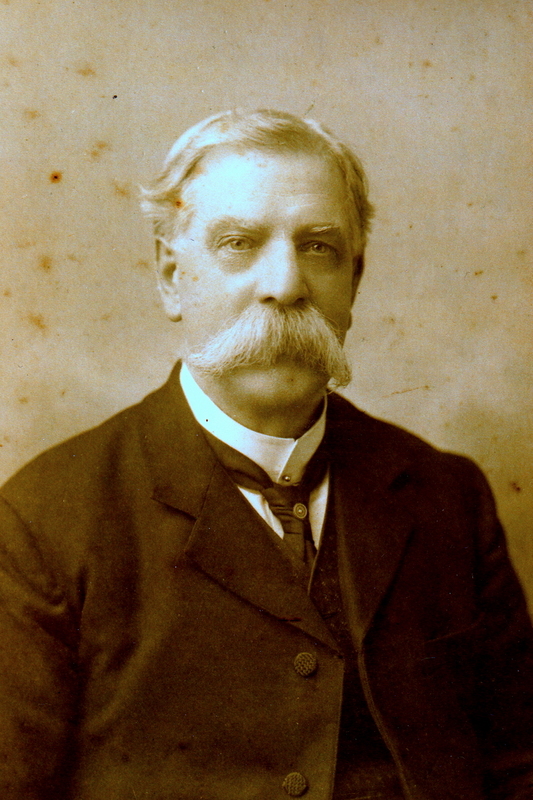 The chap in the photograph below, sporting a magnificent walrus moustache, was my great-great-grandfather. I don’t know exactly when he was born or when he died, but I do know that he worked as a cabinet maker in London and later in Plymouth during the second half of the 19th century. 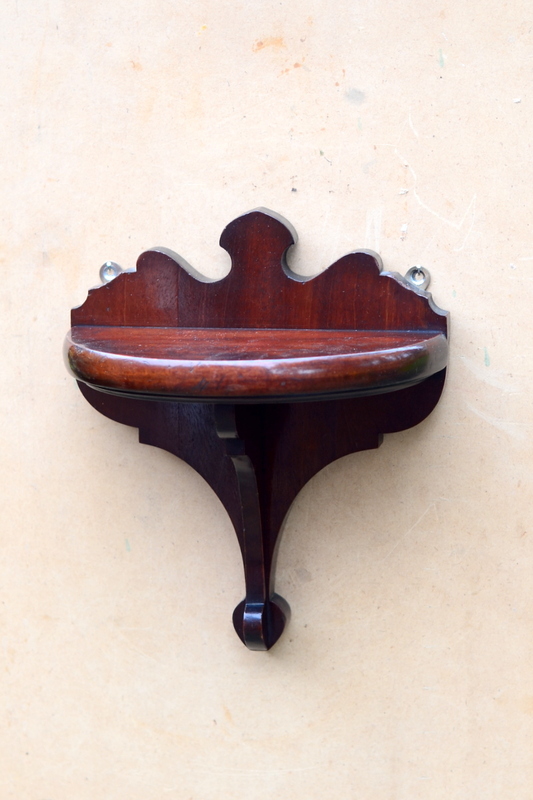 Several pieces that he made are still in the family and among them is this decorative wall bracket. I’m not sure what it was meant for – probably a small clock or an ornament. 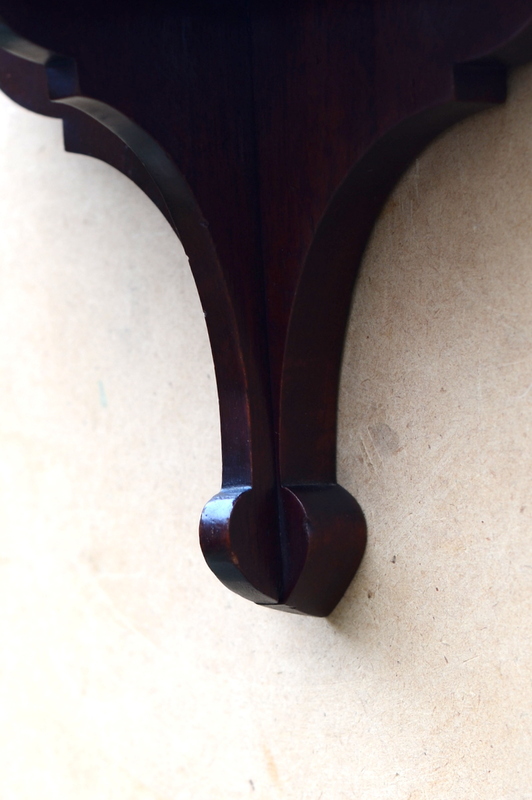 Quite apart from the pleasure of owning something made by a woodworking ancestor four generations earlier, I’ve always liked the bracket for its nicely judged proportions. And I admire his neat solution to the problem of bringing everything to a point at the bottom of the bracket. 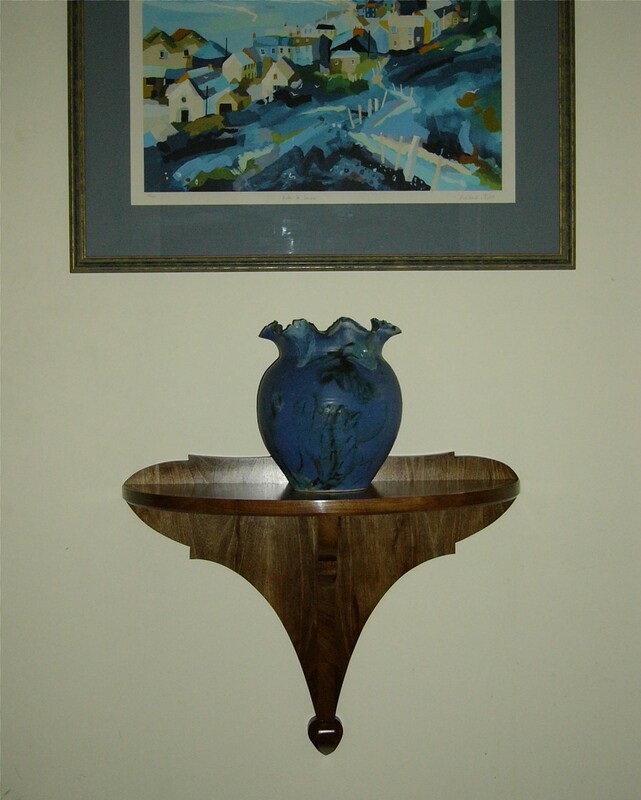 Needing a table for a narrow hallway a few years ago, I borrowed his design for a larger version in walnut. Click on the thumbnails below if you’d like to see larger pictures. 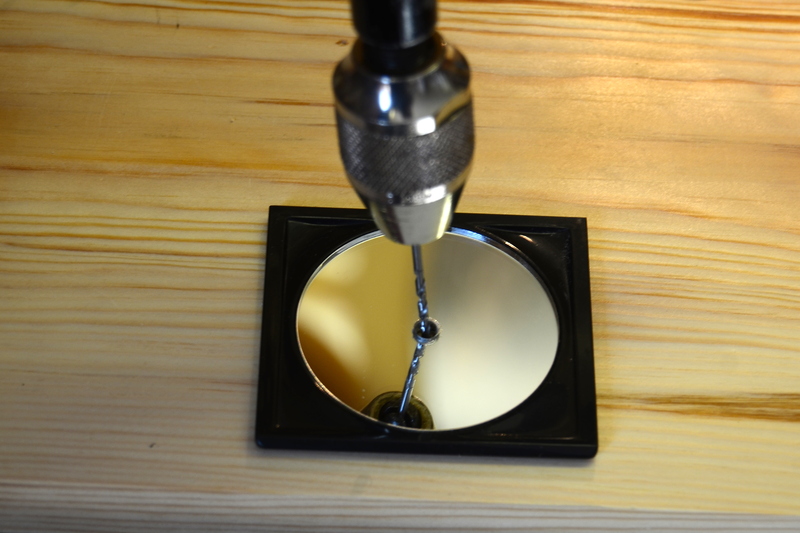 Although I was sure that I’d read somewhere that there was a way of using a mirror to help judge when a drill bit was truly vertically, I struggled to find an account of how it was actually done. Eventually, after a lot of googling, I came across this letter and illustration published in Popular Mechanics nearly 80 years ago. To find out if it worked, I bought a cheap handbag mirror. First I cut off the hinge and trimmed back the plastic mount along one edge. … and when it wasn’t. It’s a simple idea but I was impressed by how well it worked. 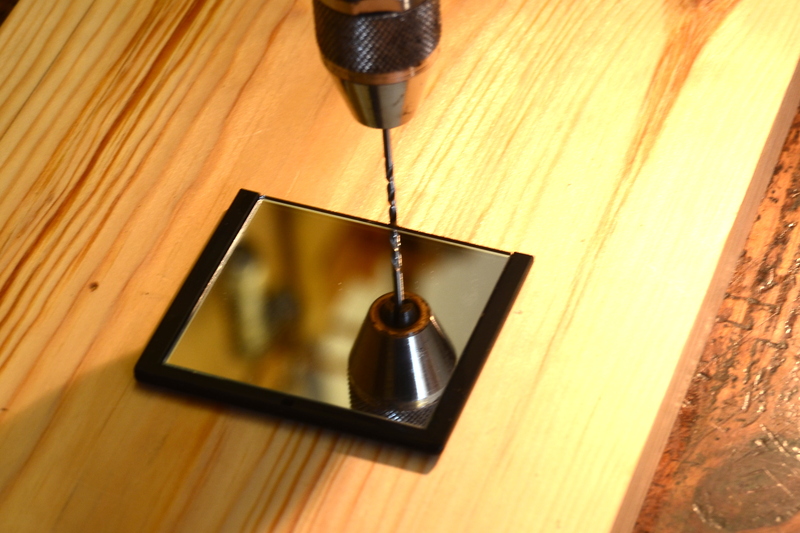 A problem though, is that the mirror only tells you whether the drill is vertical in one axis. 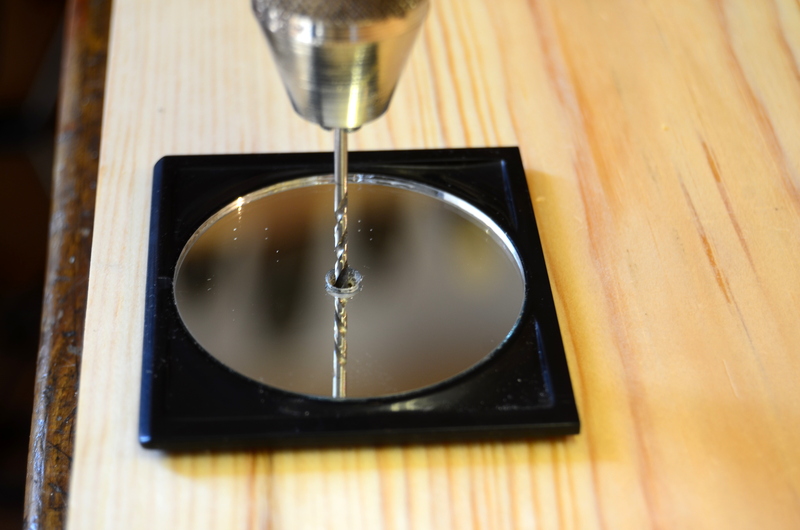 You have to move the mirror around the drill to check whether it’s vertical in the other axis and while you’re doing this, it’s easy to lose the vertical on the first axis. 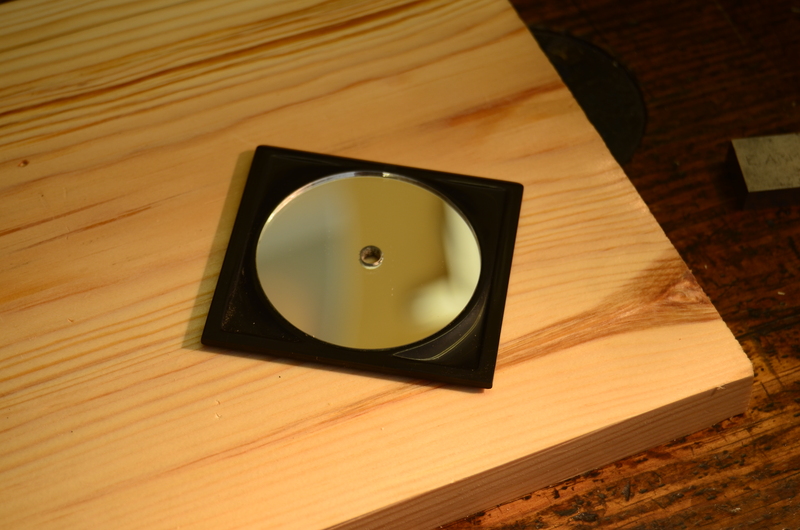 One solution might be to have an L-shaped mirror or, perhaps better still, a mirror with a hole in its centre. Then, all you’d have to do to check that the drill was truly vertical in both axes would be to move your head. So I ground a small hole in the centre of the other mirror and tried it out. This is the view when the drill is vertical. And when it’s miles off. 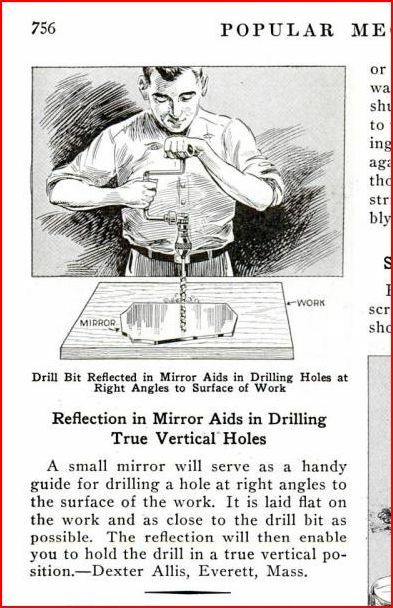 Of course, you don’t need a mirror to see when the drill is as far out as that. The benefit is that it makes it easy to spot small deviations from vertical. Does it work in practice? 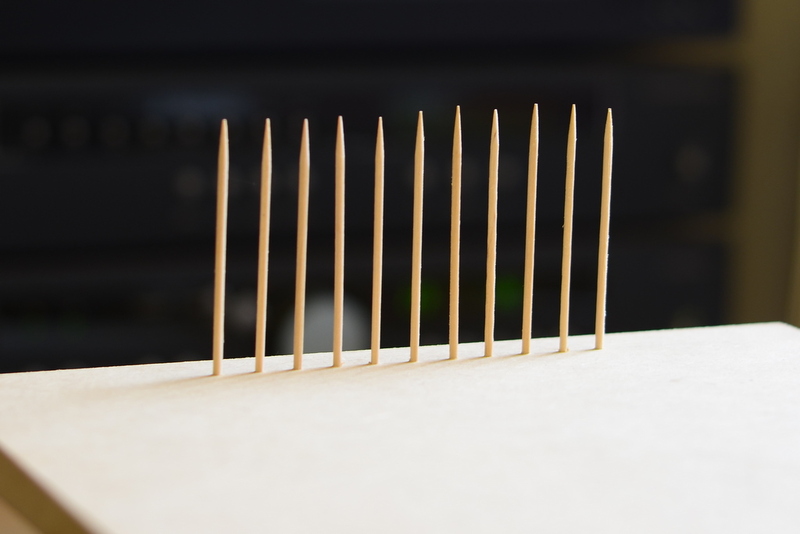 As a test, I drilled ten 2mm diameter holes at 10mm intervals along a line in a piece of MDF and stuck cocktail sticks into them. Not perfect – but not bad either. 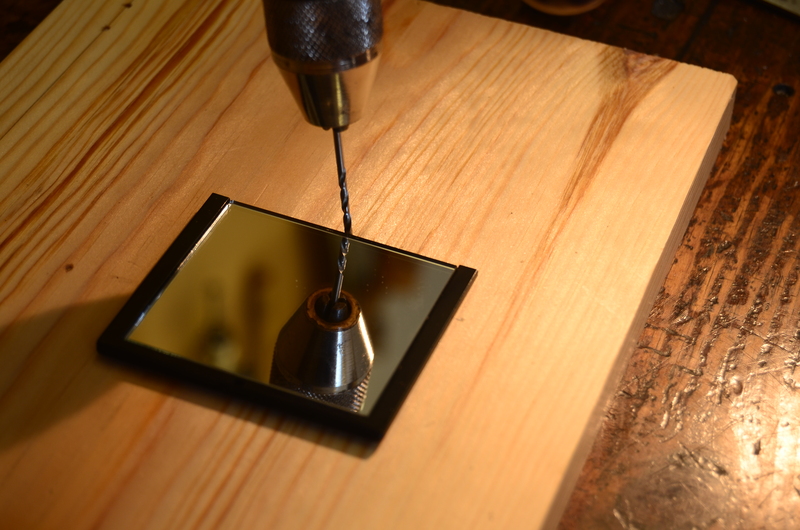 Certainly better than I was able to do in a repeat of the experiment when I used a small try square instead of the mirror as a guide, as you can see below. 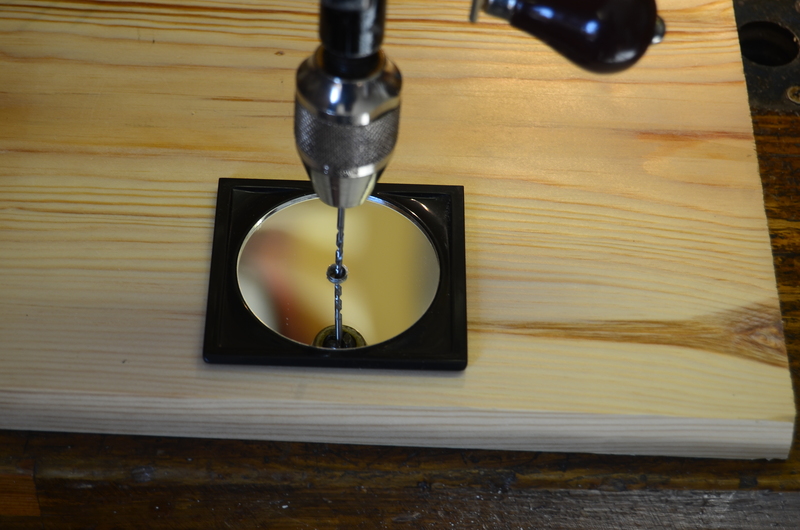 Obviously, the best way to drill a truly vertical hole is to use a drill press. 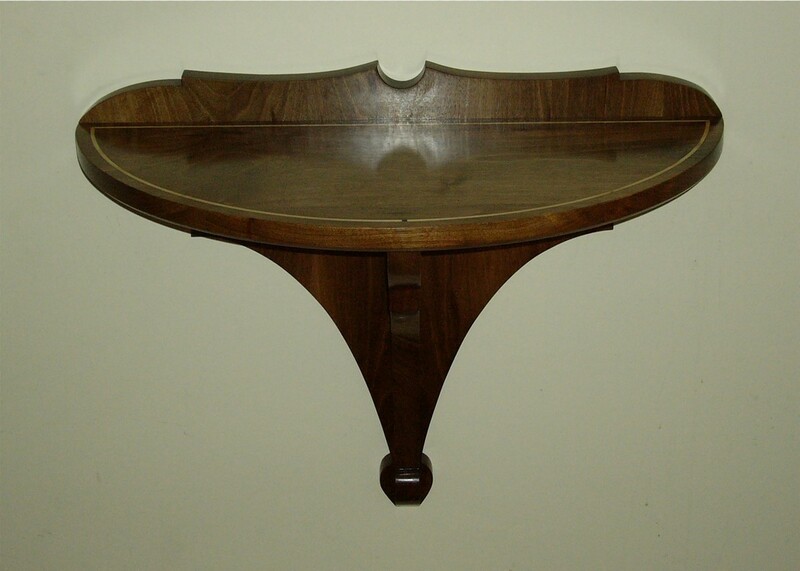 But there are occasions when this is impossible because the work piece is too large or too awkwardly shaped. It’s then that this trick with mirrors might come in handy. 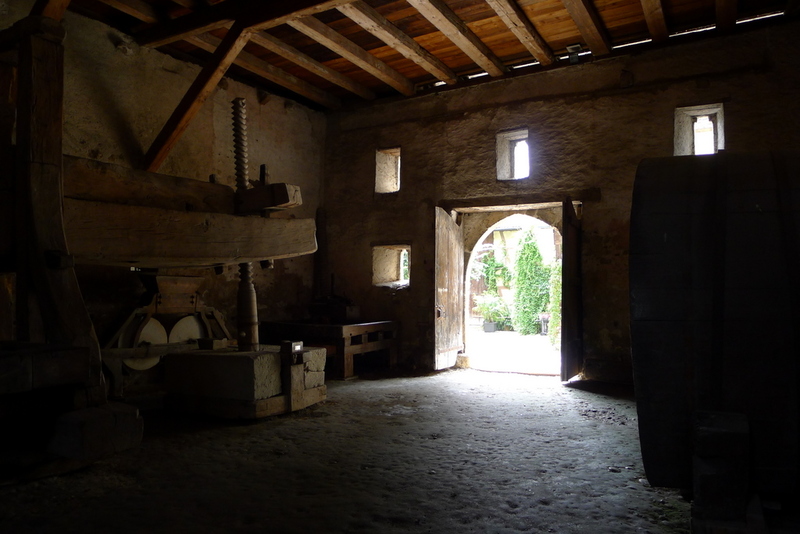 A trip this summer took me to Stein am Rhein in northern Switzerland, where I visited the museum of the abbey of St Georgen – a place both fascinating and frustrating. Fascinating because of the interest of the buildings and their contents. Frustrating because there was so little explanation: no convincing narrative about how or why the place, which ceased to be a religious foundation 500 years ago, still exists. Even so, it contained several things to interest woodworkers. 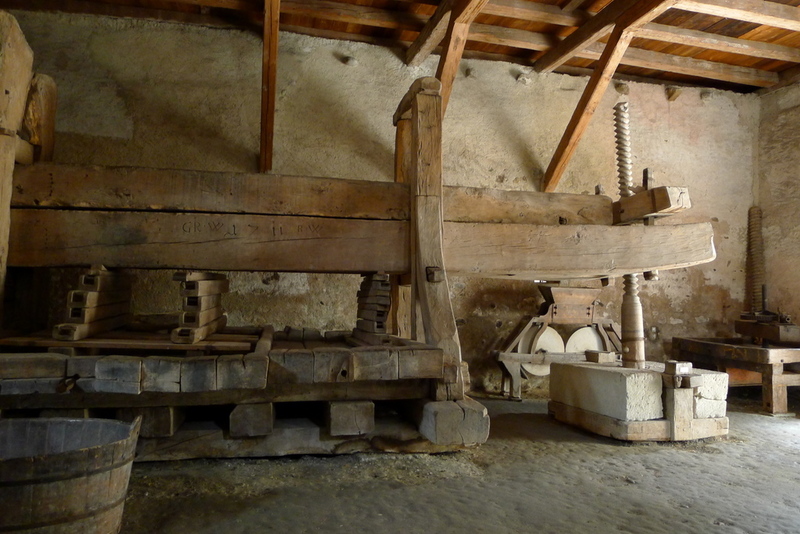 Here are three: the first was this enormous wine press which, if the carving on the main beam is to be believed, was built in 1711. 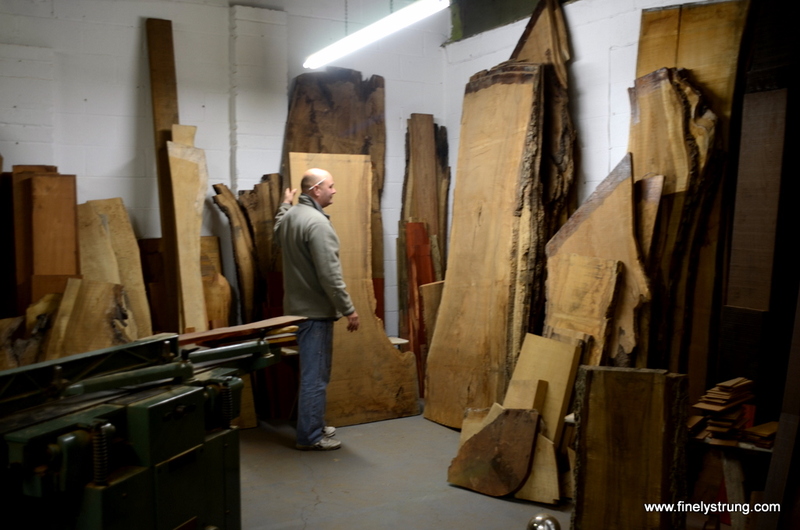 Maybe it’s an attraction of opposites but, as an instrument maker who has to fuss about tenths of a millimetre, I couldn’t help thinking what fun it would be to chop out mortices and tenons on this sort of scale. 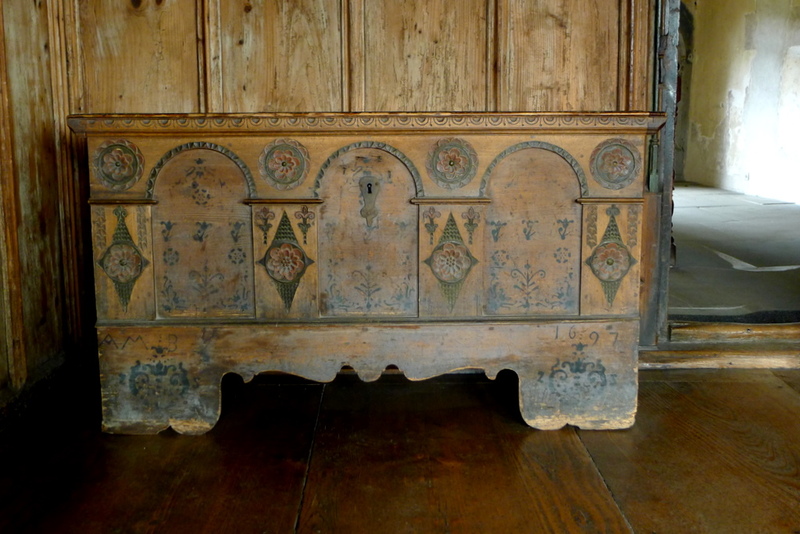 The second was this fine chest decorated with paint and chip carving. 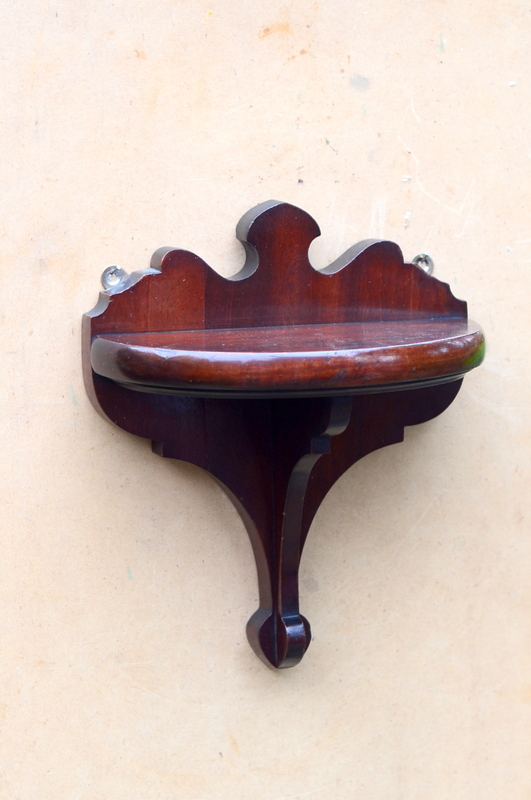 It too, had a date carved in it – 1697, just visible bottom right – which seems plausible enough. But what on earth was it doing in an abbey that had stopped functioning as an institution during the reformation in the early 1500s? 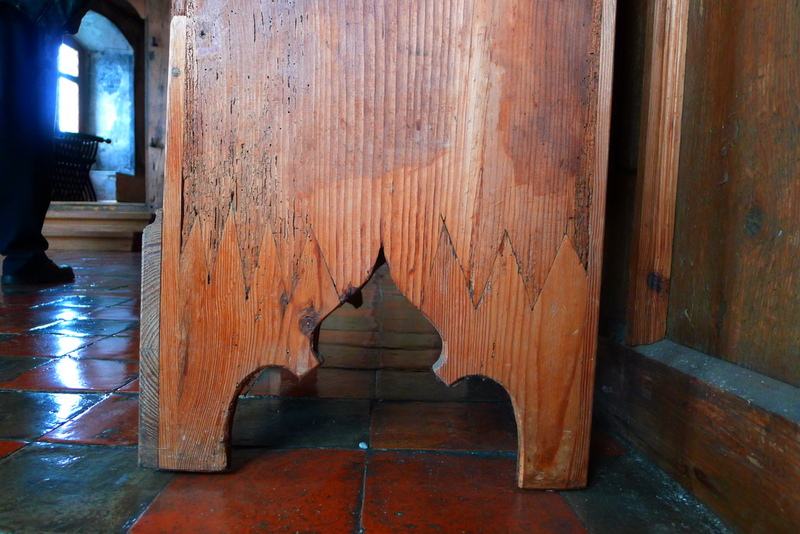 The last was this remarkable repair to the bottom of a pine cupboard. Rot and wood worm must have got into it, but someone thought that that it was worth saving and, perhaps inspired by the Alps which aren’t too far away, scarfed in a new footing. I’d never seen anything like it. Please write if you know of other examples or can explain more about the technique. A comment on the previous post asked about setting the honing angle. Here’s one way of doing it. Set a sliding bevel to the angle you’re after. (I chose 30°.) 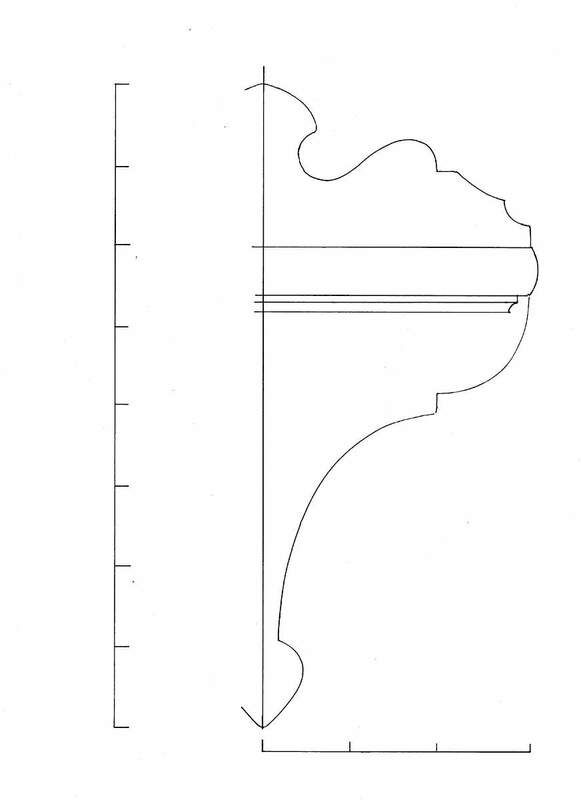 Then, after fitting the chisel into the mould, adjust the position of the mould in the honing jig, by eye, so that the longitudinal axis of the chisel runs parallel with the blade of the sliding bevel. I glued a strip of wood across the underside of the mould so that it can be located in the honing jig at the same angle every time. And that’s it. 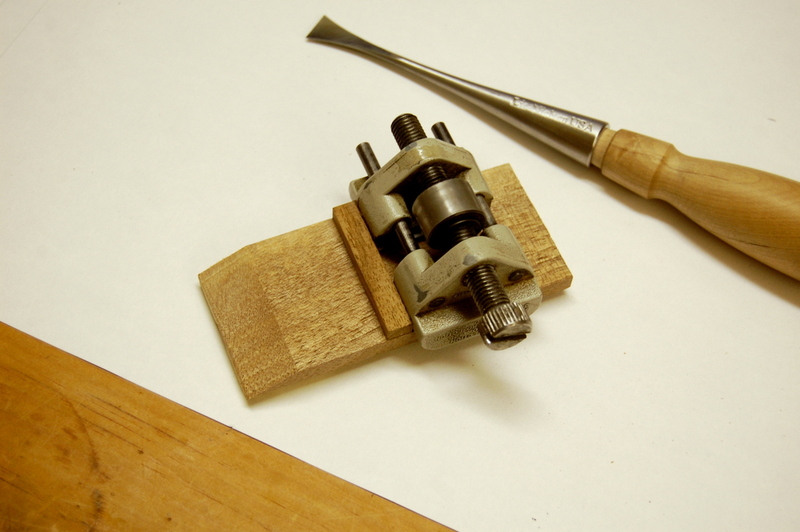 Eventually, I suppose, repeated honing will shorten the chisel and increase the angle of the secondary bevel. That will mean that it’s time to regrind the primary bevel and repeat this process to restore the angle of the secondary bevel. A point I forgot to mention in the earlier post is that it’s worth creating a stop in the moulding at its upper end to prevent any tendency for the chisel to slide up while it’s being honed. 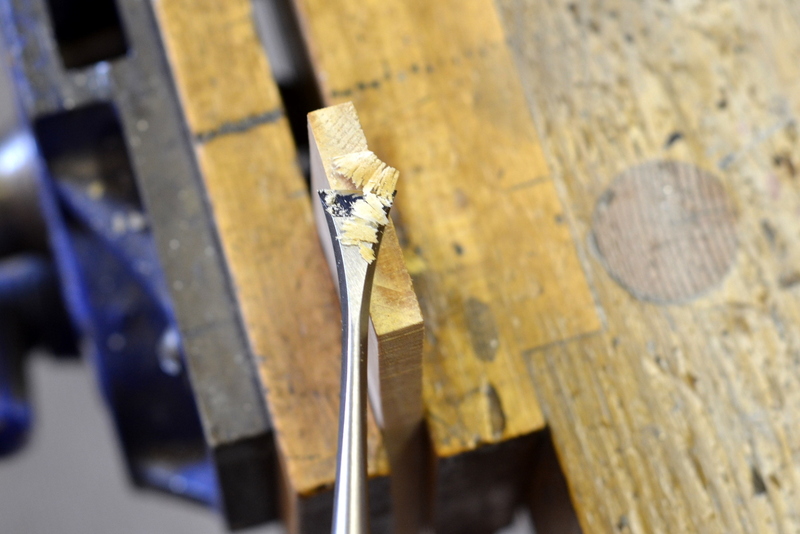 Here you can see a stop formed by the lip that mirrors the indentation between the socket and the handle of the chisel. 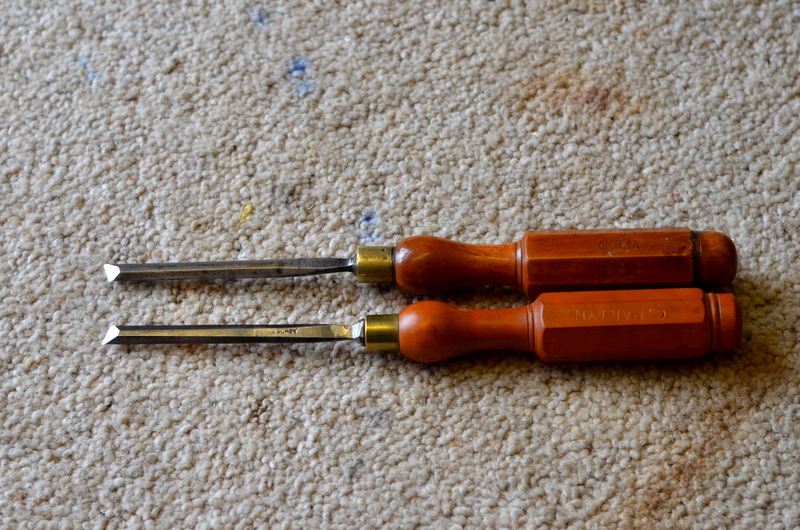 A pair of chisels reground with left and right skewed edges is almost essential for cleaning out the sockets of lap dovetails. 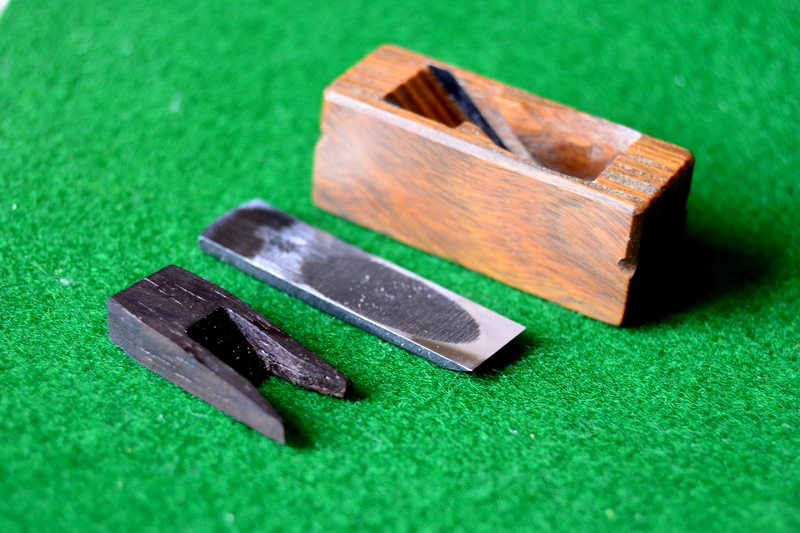 These chisels are useful for other tasks as well – tidying up the inside of the pegbox of a violin or cello, for example. I’ve got several pairs in different sizes and, although I don’t use them everyday, there are jobs where no other tool will do. Actually, that isn’t quite true. A fishtail chisel makes a good substitute and, because it can work into both left and right pointing corners, you only need one tool rather than a pair. 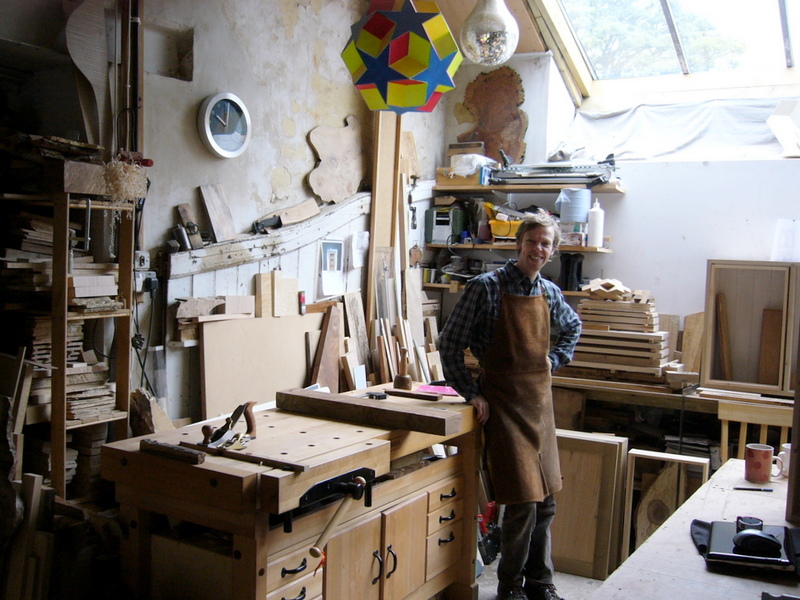 Last Summer, visiting Mark Bennett in his workshop in Yorkshire (see below) I saw him using one made by Lie-Nielsen. 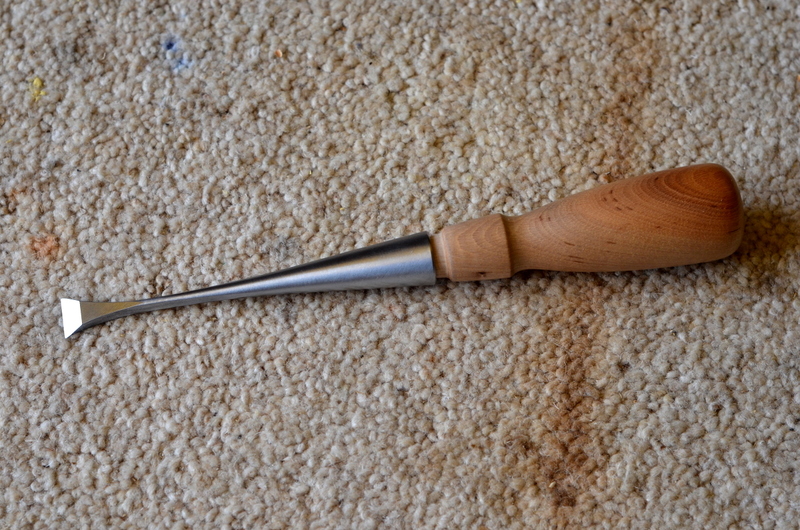 It was such an attractive looking tool that, even though I didn’t really need it, I couldn’t resist buying one to try. 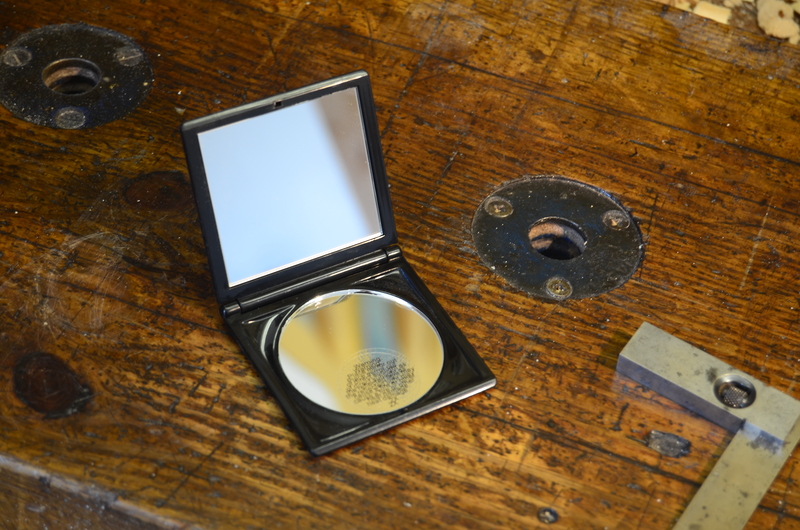 After it arrived, I honed it, maintaining the 25° angle of the original grind. Perhaps it was my lack of skill – keeping such a small bevel flat on the stone wasn’t easy – but I never managed to get it properly sharp. 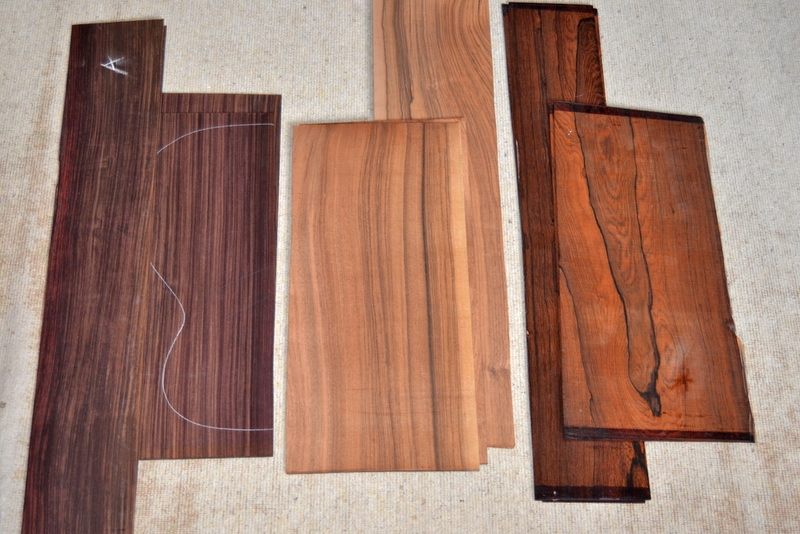 What’s more, the edge that I did achieve didn’t stand up to use on hardwoods. Of course, there’s an obvious solution to both these problems: create a secondary bevel at a slightly steeper angle. Indeed, Lie-Nielsen recommend exactly that in the leaflet that comes with the chisel. However, I was reluctant to do this freehand because, although I was sure that it would work well enough the first few times, I knew that in the long run I’d be unable to maintain the same angle. 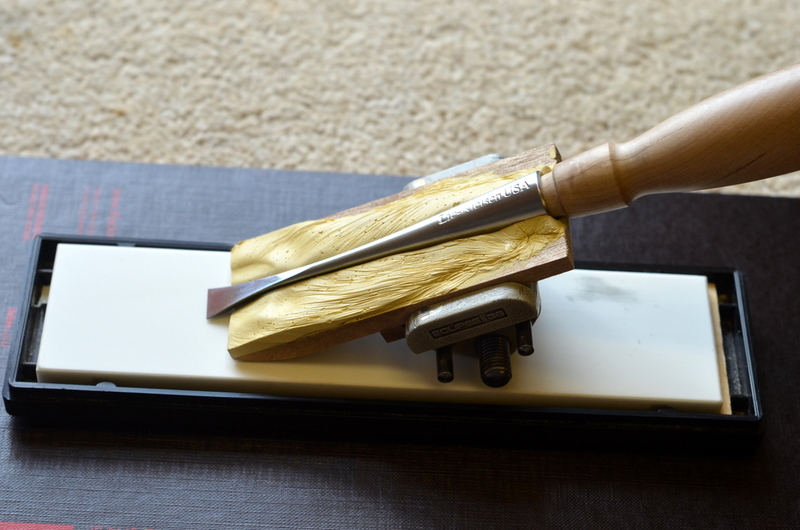 This would mean that I’d end up with a rounded secondary bevel that would require more and more honing with each sharpening to get a decent edge. And, quite apart from the extra time this would take, it’s a bad idea to hone or grind a fishtail more than absolutely necessary. There isn’t much metal there in the first place and with each grinding the cutting edge gets progressive narrower. A honing jig would have solved the problem, except for the fact that I couldn’t make the conical shape of the shaft of the tool fit securely into any of the jigs in my workshop. In the end, I got around this difficulty by casting a mould out of the sort of two-part wood filler that sets hard in about 30 minutes. I’ve written about this technique for holding awkwardly shaped object before (scroll down in the Tools and Jigs section of the website) so I won’t go into it in detail here. 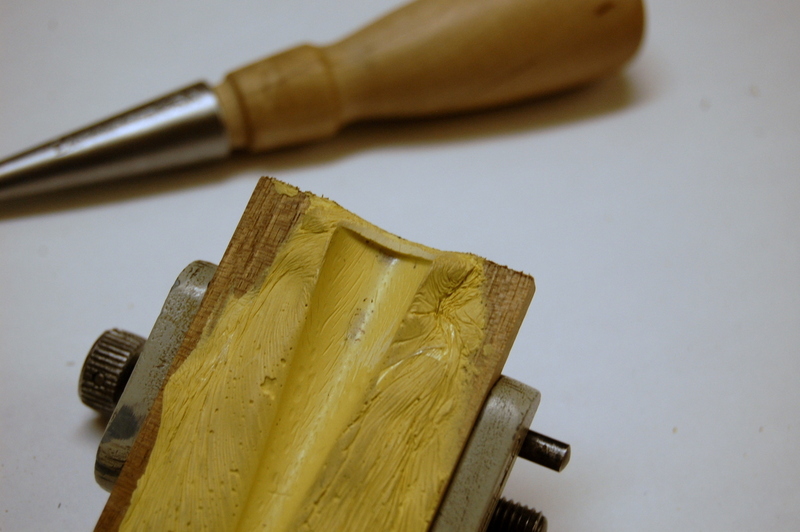 But briefly, you mix a generous quantity of the filler, spread it on a board (in this case a thin piece of wood of a size that would fit into an Eclipse honing jig), cover with a layer of cling film, and press the object you want to mould into it, holding it place with a weight or a clamp until the filler sets. Then, of course, you can take it out and get rid of the cling film. And it worked – at least for one of the objectives. 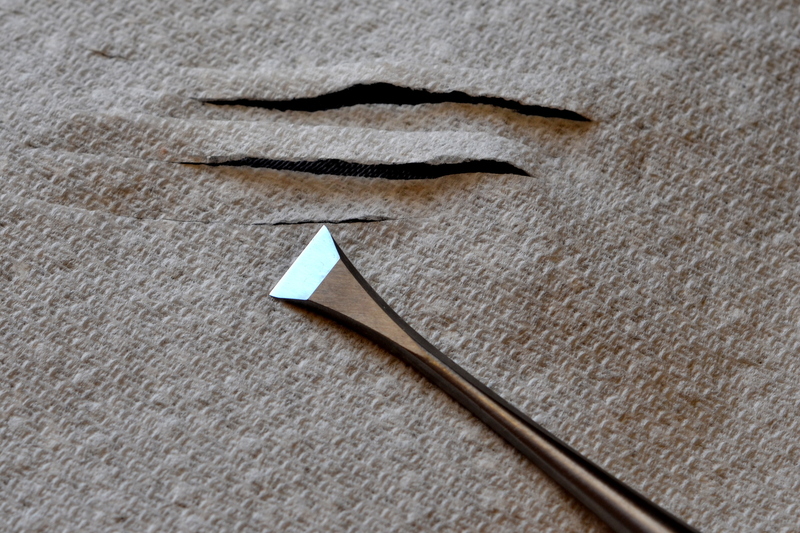 The edge on the chisel was keen enough to slice soft paper towel and to pare endgrain. Whether it will achieve the second objective of minimising attrition of the blade with repeated sharpenings is another matter. Time will tell. James Gordon, an engineer, materials scientist and naval architect, wrote two books that I highly recommend. 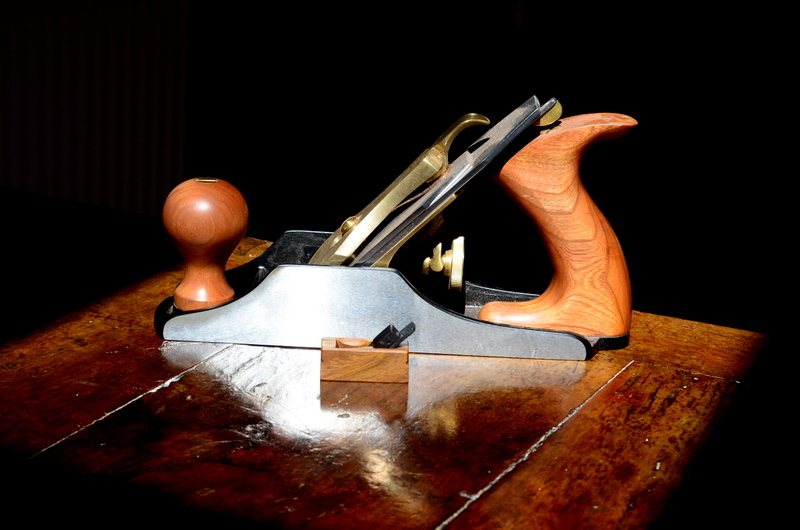 I was about to write …to woodworkers but, actually, I highly recommend them to anyone who has the slightest interest in buildings, ships, aeroplanes or other artefacts of the ancient and modern world. My copies have been read and consulted so often that they’re falling apart. 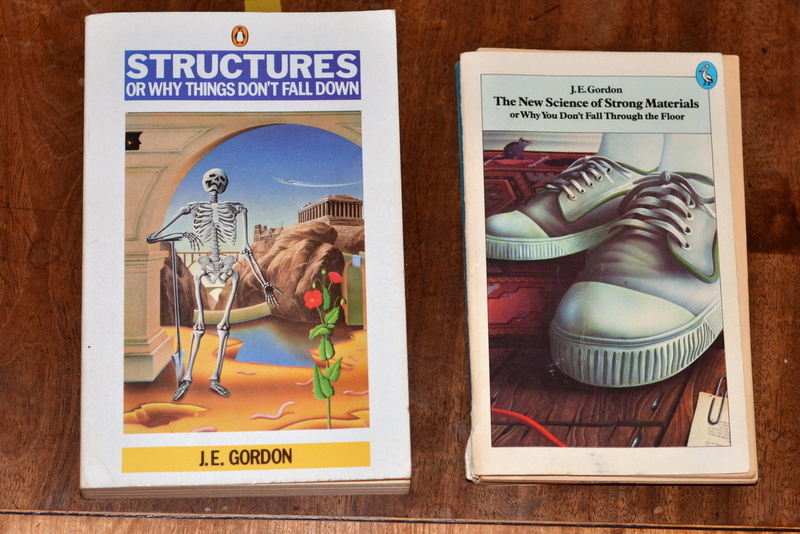 They are The New Science of Strong Materials or Why you don’t fall through the floor (first published in 1968, but still in print: ISBN-13: 978-0140135978) and Structures or Why things don’t fall down (first published in 1978 and also still in print: ISBN-13: 978-0140136289). Both are written for a non-expert readership and there’s very little algebra or mathematics. They’re fun too: Gordon writes clearly, wears his learning lightly and the text is spiced by his whimsical sense of humour. The New Science of Strong Materials has many interesting things to say about the properties of wood and why it’s such a wonderful and versatile material. There’s stuff about how wood is able to cope with stress concentrations and limit crack propagation, about how glues work, the distribution of stress in a glued joint, and many other things of deep background interest, if not of immediate practical significance, to people who use timber. The second book, Structures, is equally gripping. It explains how medieval masons got gothic cathedrals to stay standing, why blackbirds find it as much of a struggle to pull short worms out of a lawn as long ones, and the reason that eggs are easier to break from the inside than the outside. 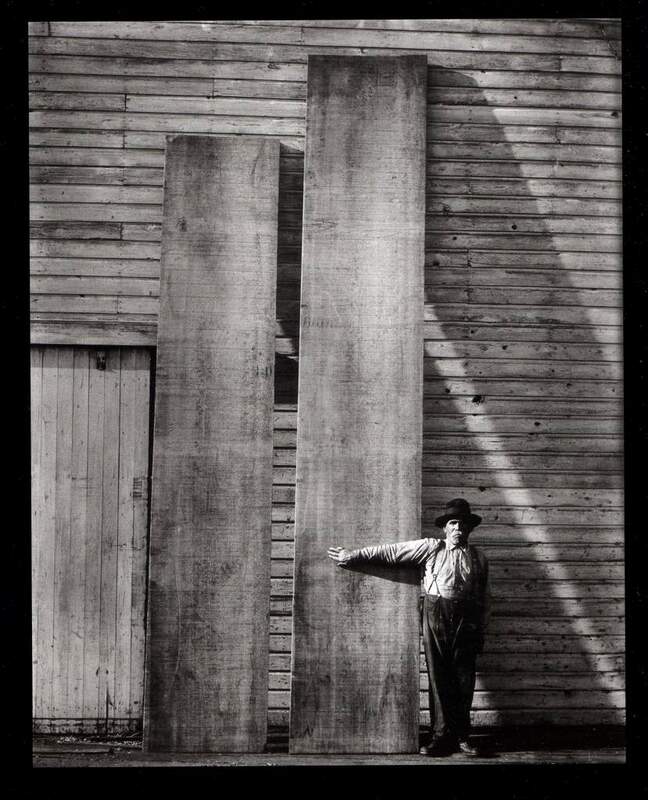 Of more direct relevance to woodworkers is its straightforward account of how beams work – which means that, if you’re thinking of making something like a bed or a bookcase, you can calculate whether the dimensions of the boards that you’re planning to use are up to the load they will have to bear, which is obviously useful in making sure that your structure is strong and stiff enough. Slightly less obviously, it’s also helpful in giving you the confidence to pare down the amount of material that you might otherwise have used. 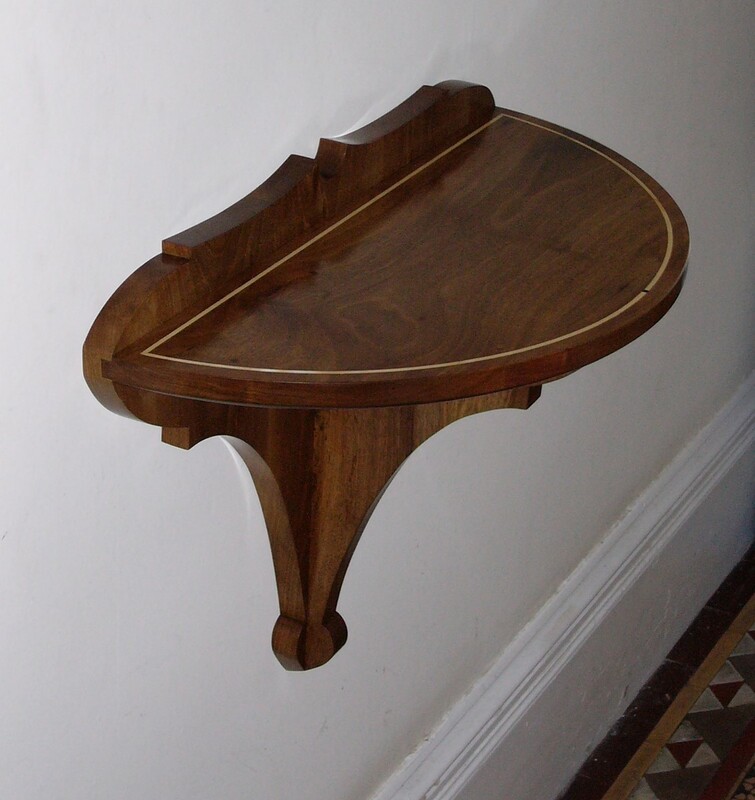 A common fault of amateur woodworkers, it seems to me, is that when designing and making something small, they tend to use wood that is far thicker than it needs to be, which means that the finished object looks heavy and clumsy. Conversely, when making something large, they tend to use wood that is less thick than it should be, and the structure often ends up rickety and unstable. 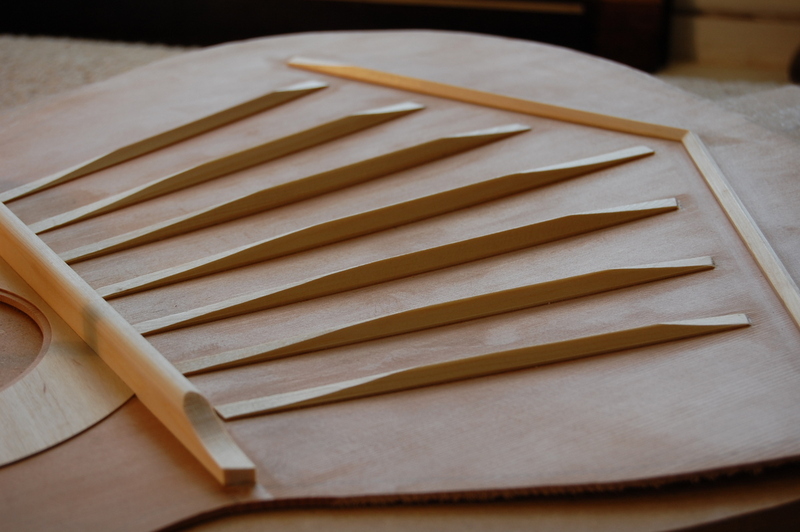 Knowing a bit about beams might also be advantageous for guitar and violin makers. Here’s an example: take a strut or harmonic bar, rectangular in section, that you’re intending to glue onto the soundboard of a guitar. How is its stiffness related to its shape and its dimensions? What’s the best way to maximise stiffness while minimising weight? Elementary beam theory tells us that, for a given length, stiffness is proportional to the width of the beam and to the cube of its depth. So if you double the width, the stiffness also doubles. On the other hand, doubling the depth, increases stiffness 8 times. If stiffness is what you’re after, it’s a lot more efficient to make the bar deeper than it is to make it wider. 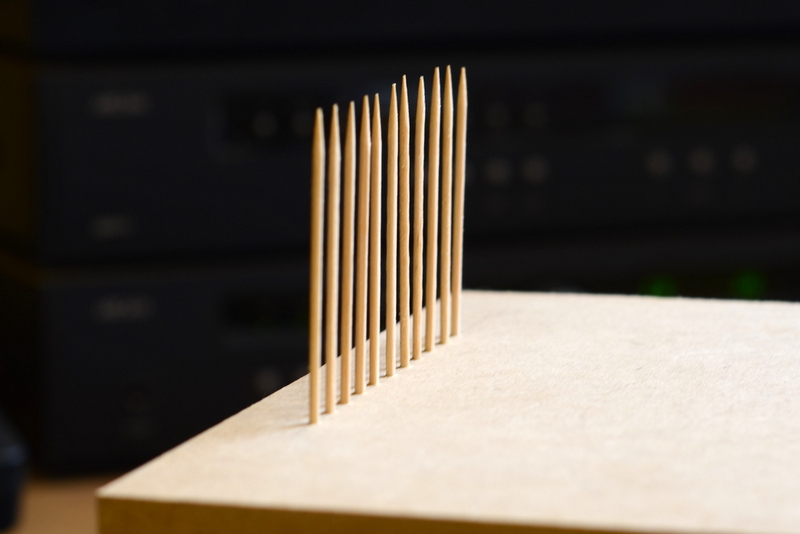 This cubic relation between depth and stiffness could be something worth keeping in mind when planing down soundboard braces after they’ve been glued. If a brace is, say, 6 mm high to start with, planing it down by 1.5 mm to a height of 4.5mm will reduce its stiffness to less than a half of what it was originally. 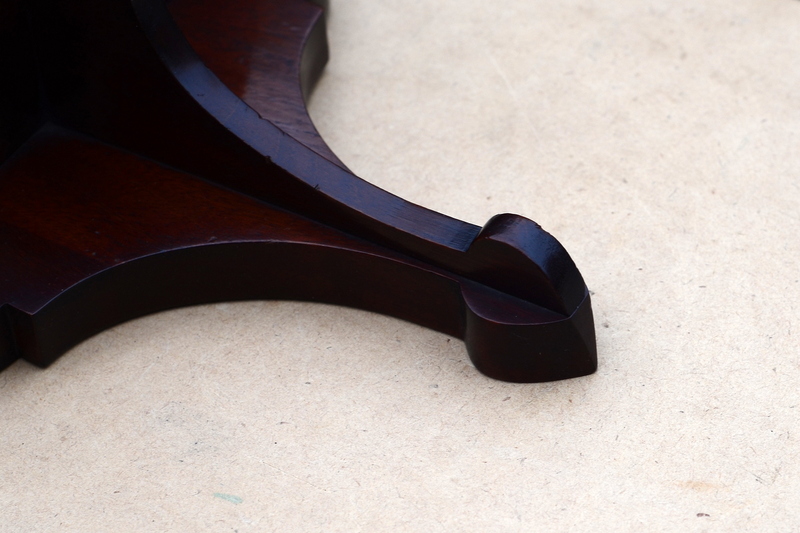 And shaping the braces to make them triangular or arched in cross section also reduces their stiffness considerably. Mind you, like so many attempts to understand guitars from a scientific point of view, things rapidly get complicated. A structural engineer with whom I discussed the matter agreed with what I’ve just said about the depth of the beam being a powerful determinant of its stiffness. 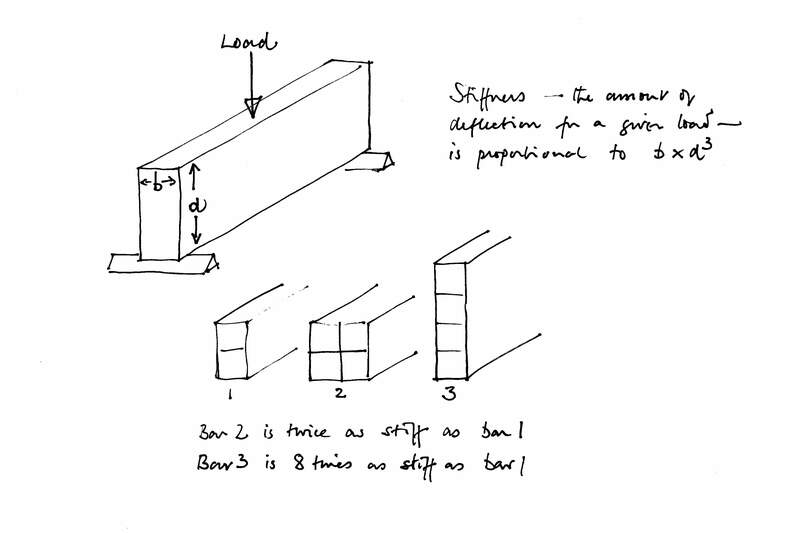 But he pointed out that where a beam is an integral part of a structure, the stiffening effect is much greater than you would guess from calculations that assume the beam is simply supported at its ends. This is certainly the case of guitars, where the braces are glued to the soundboard along their entire length and clearly count as an integral part of the soundboard structure. In such circumstances, he explained, the overall stiffening effect provided by multiple braces will be large and might well overwhelm the influence of the stiffness of any individual brace. I thought that this was a very interesting idea and that it might begin to explain why so many different bracing systems work remarkably well. In Roy Courtnall’s book, Making Master Guitars, he give plans of soundboard strutting taken from guitars by a number of famous makers. Superficially they’re fairly similar, all being based on a fan-like pattern of 5, 7 or 9 struts. There are minor variations, of course. Some are slightly asymmetrical, some have bridge plates and closing bars and so on. But the biggest differences lie in the dimensions of the braces. Courtnall shows a soundboard by Ignacio Fleta that has 9 fan struts and 2 closing bars which are 6mm in depth and an upper diagonal bar 15mm depth. 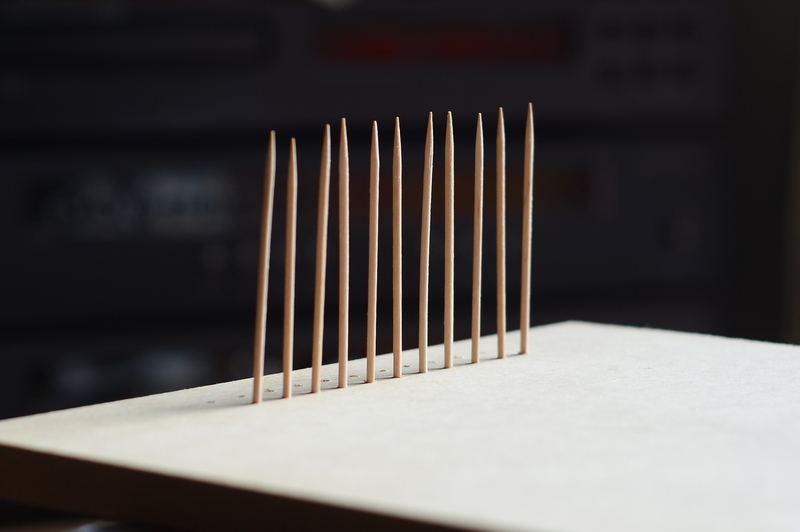 By contrast, a soundboard of similar size by Santos Hernández has only 7 fan struts 3.5mm in depth and triangular in section. Applying simple beam theory would lead one to guess that Fleta’s bracing would add more than 10 times the stiffness that Hernández’s does. But perhaps that’s a misleading way to look at it. 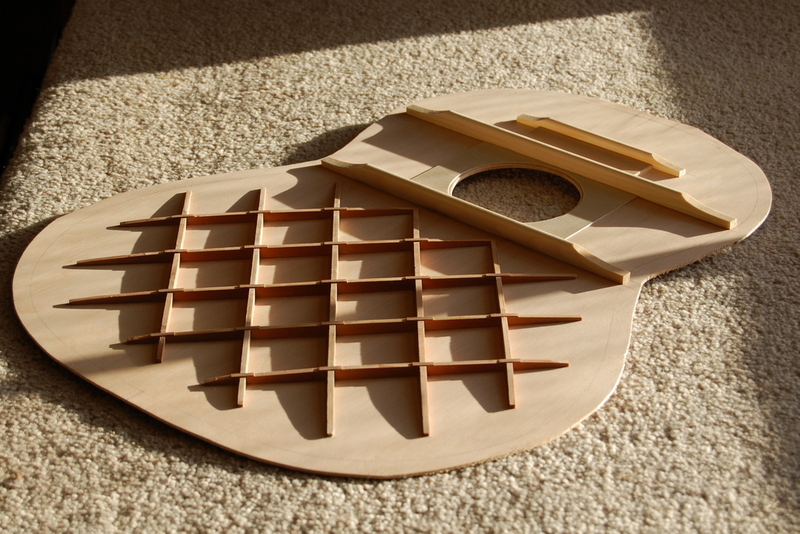 If one were able to measure or calculate the stiffness of the whole structure, by which I mean the soundboard with its bracing when attached to the ribs, the difference in stiffness between them might turn out to be much less. It’s a question that might be tackled by finite element analysis and I’d be glad to hear from anyone who has tried. Some work along these lines has been done on modelling a steel string guitar, which at least shows that the approach is feasible. Specific elements of brace design, in and of themselves, are not all that important. One has only to look at the myriad designs employed on great guitars to recognise that there is no design secret that will unlock the door to world-class consistency. All this means that I’ve been arguing in a circle. Perhaps the conclusion is that beam theory isn’t very useful to guitar makers after all. Still, if you take up the recommendation to get hold of Gordon’s books, the time you’ve spent reading this post won’t have been entirely wasted.